If you are creating or selling art, you want the buyer's hanging experience to be flawless. Giving a complimentary hook on the back of your art insures they use the correct size hook and gives you the opportunity to say Thank You. We offer our standard nickel drywall hooks or the pro brass hooks in a Thank You courtesy bag. The professional Brass Hooks provide a lasting impression of quality and durability to your customers. The nails with the Brass Hooks leave only a pin hole in the wall and also work well with plaster walls. 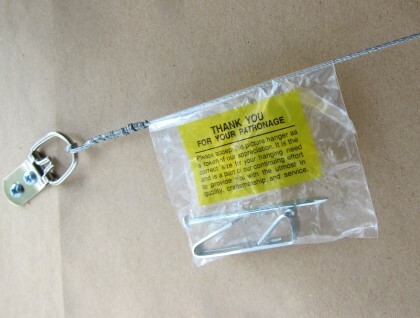 The Brass Hooks are reusable and have instructions on the front and back of the individual bags.